On this page are my suspected variable star discoveries. Following AAVSO preference, each star is listed by its GSC name, unless it doesn't have one, in which case a GSC2.3 name is shown. On the left are finder charts (courtesy of the Aladdin Sky Atlas), and on the right are phased plots and in some cases 3D models of what the system might look like. Below each plot is some information about each star, as well as a link to the AAVSO page concerning the star. The stars are listed in order of increasing right ascension. If you've got the equipment and the time, additional observations of any of these objects can be submitted to the AAVSO. Top: Five night lightcurve, reduced in MPO Canopus. Bottom: Synthetic lightcuve generated in Binary Maker (blue line) with red dots showing observed data points. Overlay is a 3D model. The fit is somewhat contrived since it was necessary to introduce a "starspot" in the more massive star to compensate for the O'Connell effect. Top: Four night lightcurve, reduced in MPO Canopus. Bottom: Synthetic lightcuve generated in Binary Maker (blue line) with red dots showing observed data points. Overlay is a 3D model. 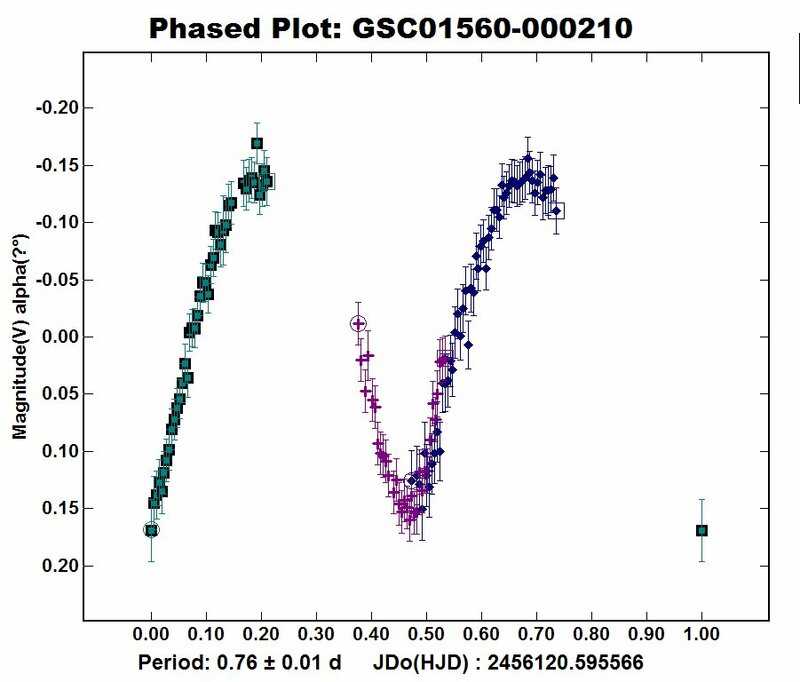 Variable Star not *officially* discovered. I ran across GSC 01560-000210 in 2012. 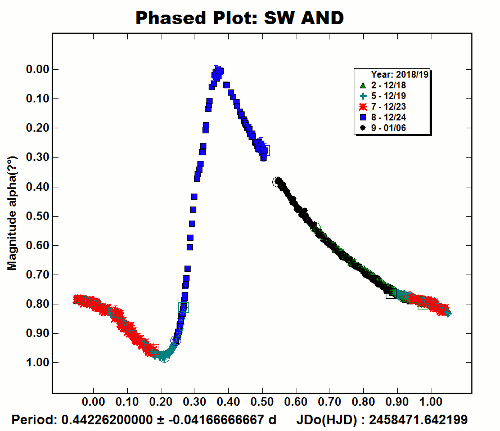 It is, without doubt, an EW type eclipsing binary. However, I don't have a dense enough light curve to submit it to the AAVSO for official recognition, and given that it's now six years later, I doubt I'll ever get around to it. So, if anyone wants to officially discover a variable star feel free to do so you can start from scratch with this one. 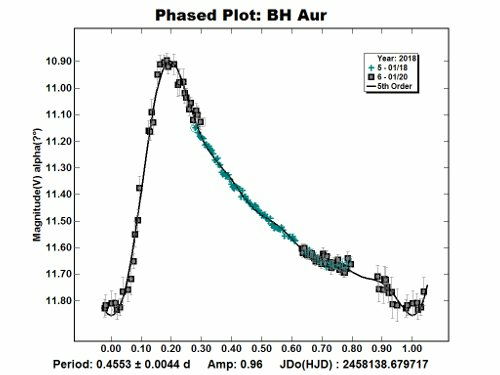 RA 17h 48' 47" DEC +19 56' 02"
BH AUR is a RR Lyra AB (RRAB) type star pulsing in fundamental mode. 180 data points, 120 second integratons, J/C V* filter. Observations requested by the AAVSO. TZ AUR is a RR Lyra AB (RRAB) type star pulsing in fundamental mode. 181 data points, 150 second integrations, J/C V* filter. SW AND is a RR Lyra AB (RRAB) type star. 45 second integrations, J/C V* filter. 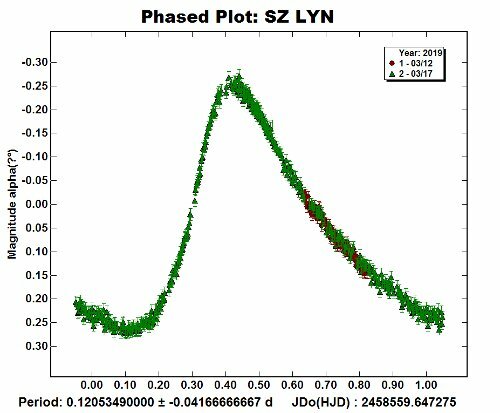 SZ LYN is a Delta Scuti type variable, remarkable for their short periods. In the case of SZ LYN, it runs through its entire brightness range is less than three hours. 20 second inetgrations, J/C V* filter.